Asana literally means sitting, sitting down, abiding, dwelling, or a seat, place, or stool. In hatha yoga it is used to refer to various postures used to make the body strong, flexible, healthy and filled with prana. The first and most important aspect of āsana for us will be proper sitting posture. To do jāpa, pūjā, and meditation it is best to be sitting in a posture that allows us to sit as long as we want as well as in an alignment that allows the subtle energy to move freely. This section will do its best to explain some of the basic concepts of proper alignment in sitting posture, but it can never replace the guidance of a well trained teacher. Once the āsana tattva (the essence of the pose) is understood, then the alignment can be applied in many variations of āsana. For long periods of sitting it is recommended to have the knees below the hips. Some people are flexible enough to sit directly on the floor. If you can that is fine, as long as you insure that you have the proper posture. For most to get the proper pelvic tilt we need to raise the buttocks a few inches off the floor. It is better to sit up on something, than sit on the floor with bad posture. The lower part of the sacrum must move towards the back and the top of the pelvic bone must move forward. This will align the lower back. Because of lack of flexibility most people cannot do this sitting flat on the floor, by raising the buttocks up slightly, bringing the knees lower than the pelvis the back can straighten. The space in between vertebrae is increased, and prana can move more freely up and down the spine. Pelvic tilt is the first level of grounding the body in a sitting posture. Supta Virasana can help long term to get the sacrum deeper in alignment, moving in and up, (chairs make it worse). In advanced practice, one can bring the hip points closer together thereby spreading the sit bones and allowing the root chakra to ground. Once a base has been made, then we have to pull up the shoulders by lengthening the spine. It is important not to pull the shoulders back to much as the middle upper back will start to pain after some time. The scapula (shoulder blades) are to spread away from each other and the bottom of the scapula tucks in lifting the chest and “opening the eyes of the heart”. It is important to hold the chest up with an extended spine from the entire back, and not just try to hold yourself up by jutting the shoulders back. The top of the scapula move laterally, the inner edge moves down, the lower edge spreads out, the lateral edge slightly could move up depending on the person's previous alignment. The ribs tend to stick out to overcompensate sitting upright, they should be kept in line with the rest of the body. Remember to let the shoulders relax down (as stress pulls them in towards the ears). It is more important to relax the shoulders than push or pull them anywhere, rather than pulling or pushing or doing to create alignment, relax the muscles that are pulling you out of your proper alignment. The clavicles spread laterally, the sternum lifts slightly and the xyphoid process should descend. The spiral rotation of the arms keeps the chest spread and open. If you internally rotate the forearms it will spread the shoulder blades creating space in the upper back. This needs to be compensated with the external rotation of the upper arm which opens the front chest. These two motions seem to oppose each other at first but working together they create space in the upper chest and back. It also opens up space in the shoulder joint and naturally keeps the arms the proper distance from the torso. Next is to pull the chin in, when it juts forward it will compress the cervical spine and create a tendency to loose upper body posture. As when pulling the shoulders back, do not overdue it. Lengthen the occiput (back of the skull) upwards towards the sky lengthening the entire spine. Your base should be grounding and the head should be reaching upwards, creating space and openness in the spine. The final step is to relax the muscular system. Hold yourself up with proper skeletal alignment, and feel the muscles let go of their tension. The strength should be in the asthi dhatu ruled by the Sun, giving a strong inner core posture reaching upwards to the sky. The mamsa dhatu ruled by bhumikaraka Mars relaxes downwards towards the earth. Sickness makes the bones soft and the muscles hard, harmony of body is when the bones are hard and the muscles soft. The legs should relax allowing the hip joint to open and the femurs to sink closer to the ground. The buttocks relax into a grounded pose. Relax the internal organs, and let the shoulders and arms relax before taking any mudra. And then the most powerful aspect of relaxation takes place in the face. Our mental nature contorts our face to hold stress in various ways according to the negative or positive thoughts and emotions we experience. The relaxing of the face allows us to release these patterns and helps us return to our natural state in meditation. A deeper understanding of facial relaxation will be given in succeeding levels. 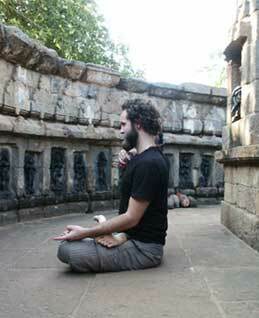 Whether standing or seated, one should exhale and inhale smoothly while performing the different asanas. When the breathing is smooth during asana and pranayama, one need not fear any disease.